Many developers sometimes use lush green golf courses as the centerpiece of their projects to attract new buyers. But more and more landowners are building communities with a different focus to attract potential homeowners — community farms. One area family wants to do just that with one of the largest remaining tracts of undeveloped land in Manatee County. Three siblings, Robert Lindsay, David Lindsay, and Fredrica “Ricki” Lindsay, are partners in the L3 Farms on S.R. 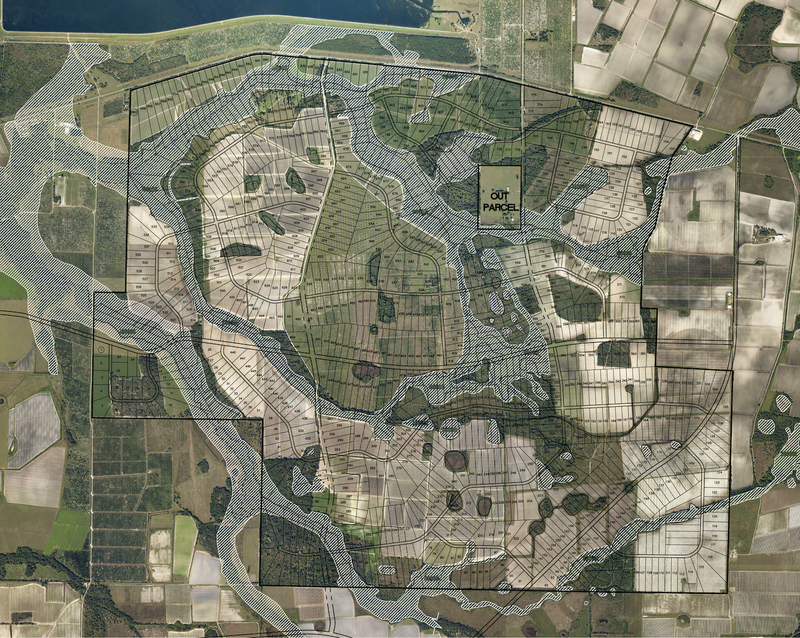 62 in northeast Manatee County and want to create Gamble Creek Village on the nearly 6,000-acre tract. 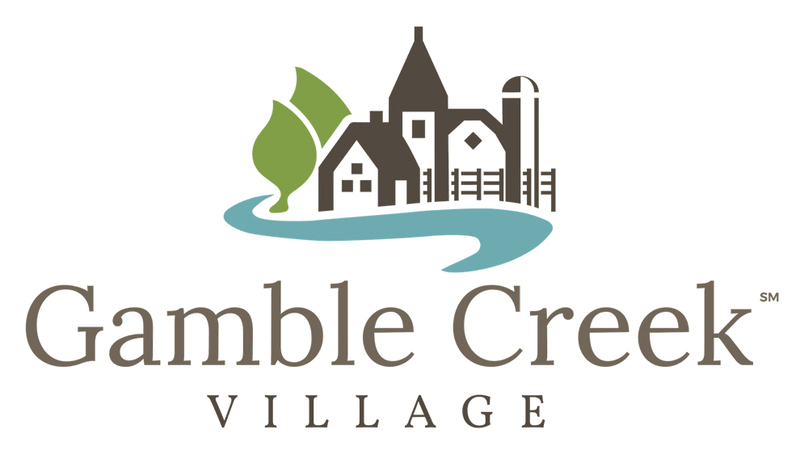 According to a provided informational document, “Gamble Creek Village is a conceptual plan that takes the forward-looking rural village approach to land use. 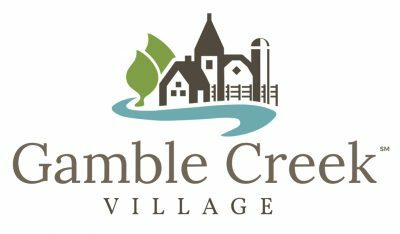 “‘Rural villages’ are a planning concept that is recognized throughout the U.S. for its thoughtful approach to land use, conservation, and community development,” the fact-sheet continued. The Lindsay family goes back five generations in Florida. 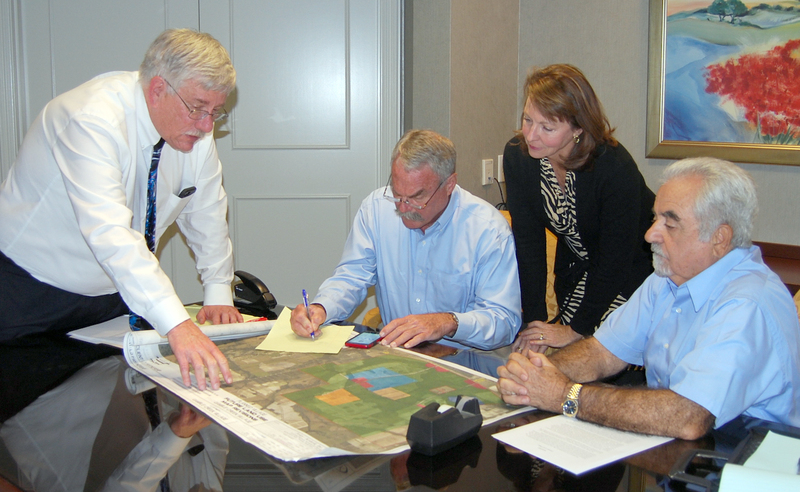 Attorney Mark Barnebey, Robert Lindsay, Fredrica “Ricki” Lindsay, and professional engineer, Bob Lombardo, discuss the Gamble Creek Village project plans for the L3 Farms property the Lindsay family owns east of Parrish. The siblings’ grandfather, David B. Lindsay, started the Sarasota Herald Tribune in 1925, and the family owned and operated the newspaper until they sold it to the New York Times company in 1982. “He (David B. Lindsay) first came to the area in World War I when he was stationed in Arcadia,” Ricki Lindsay wrote in an email statement. 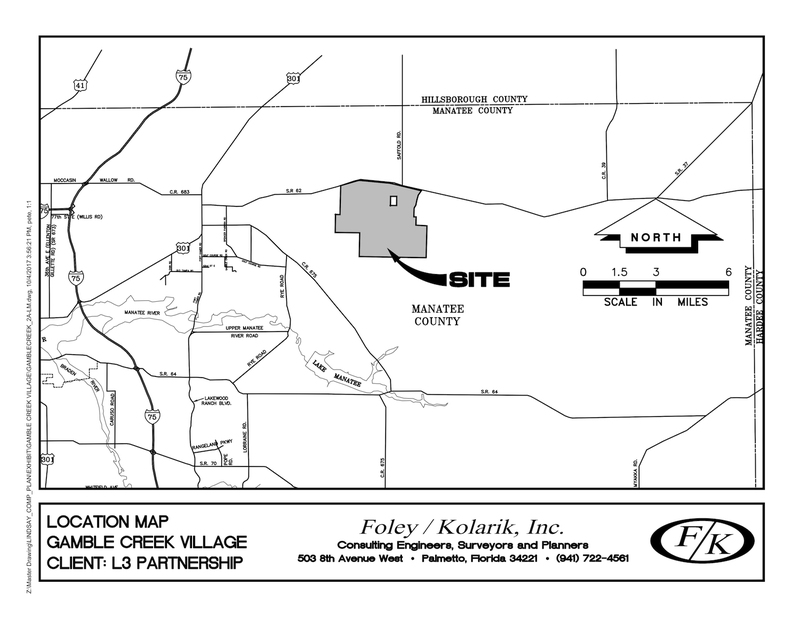 The family’s connection to Manatee and Sarasota counties was an important factor in their decision to purchase the property about 30 years ago. “As native Floridians raising families here, we wanted to be involved in the land and an industry that is deeply rooted in the community, as is agriculture in Manatee County,” Lindsay wrote. Recently they have been receiving inquiries about selling the land, which is located about 6 miles east of U.S. 301 on S.R. 62, near Parrish. “Most likely, this would be in piecemeal sections, which we hope to avoid, as it only leads to the disjointed, sprawling growth that we truly do not feel is in the best interest of the county,” she wrote. This led them to consider an alternative for the property. “Our vision is to see the land kept intact and be managed as one large parcel and not broken up into little uncoordinated subdivisions or sprawled out one-home-per-5-acres lots,” Lindsay wrote. To this end the family are seeking a text and map amendment to the Manatee County Comprehensive Plan. The change in the plan is necessary because the tract of land is about 3 miles east of the Future Development Area Boundary, a line the Manatee County Board of Commissioners established about 30 years ago. The county will extend water and sewer lines only as far as this boundary line. A proposed Future Land Use Map for the proposed Gamble Creek Village on nearly 6,000 acres the Lindsay family owns east of Parrish. Beyond that line, “the current classification for this property permits up to 1,200 homes on separate tracts, each with individual septic tanks and wells, encouraging piecemeal, uncoordinated, inefficient urban sprawl. The current code does not allow for clustered housing that actually preserves open spaces and land for agriculture,” according to the fact sheet Mark Barnebey, an attorney with the Blalock Walters law firm, provided. “Environmentally, it’s not desirable … (and) the current (land use classification) doesn’t guarantee that any of the land will be preserved for agriculture or conservation or recreation,” Lindsay wrote in her email. Therefore, the Lindsays are proposing to build a self-contained, sustainable rural village focused on maintaining an agricultural element. According to a Jan. 12, 2015, article by Trish Donnally on the ULI website publication, “Urban Land,” agrihoods are “agriculture or residential developments that revolve around working farms, and which usually include eateries featuring farm-to-table food or agriculture-based activities. “They create a sense of community, produce nourishing food, and reinforce locavore and farm-to-table movements,” the article continued. 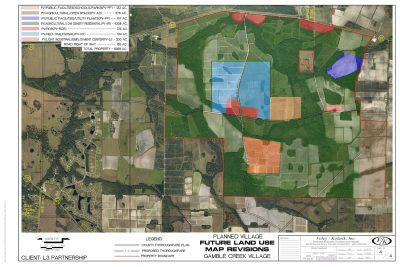 This map shows the potential development allowed under existing zoning for the nearly 6,000 acres east of Parrish the Lindsay family owns where they propose to develop a rural “agrihood” called Gamble Creek Village. According to the ULI article, there are about 200 such developments across the nation. “Serenbe in Georgia, Deseret in Orange County (Florida), and Babcock Ranch, just south of here (in Collier County), are all examples of smart planning and development,” Lindsay wrote. “Serenbe, for example, incorporates agricultural oriented activities in a community setting. “Each of the developments focuses on clustered housing so that more green space can be preserved, more open areas for conservation, recreation or agriculture, rather than homes spread out consuming large tracts of land that don’t leave space for open area,” she wrote. According to the provided informational document, the proposed project preserved 30 percent of the land as open space, parks, creek-side trails, walking path and other outdoor recreational amenities. The plan called for setting aside 123 acres for an elementary and middle school, with space for a county recreational park. There will be water and sewer treatment facilities on 123 acres, since the county will not provide utilities past the Future Development Area Boundary. “As an ‘agricentric’ community, 376 acres are permanently designated as agricultural land, but that is only a part of the land preserved as open space and agricultural,” according to the informational document. And housing will be capped at 7,200 units, fewer than two units per acre overall, but most of the homes and apartments will be clustered in the 514-acre rural village, along with shopping, community gathering spots and other conveniences for the residents. “The vision is of a community that encourages intergenerational living — a complete, vibrant village, not an isolated gated subdivision,” the informational document stated. There will also be 200 acres designated as light industrial/employment center, to provide jobs for those living in the village. The nearly 6,000 acres the Lindsay family owns where they propose to develop Gamble Creek Village is about 6 miles east of Parrish.